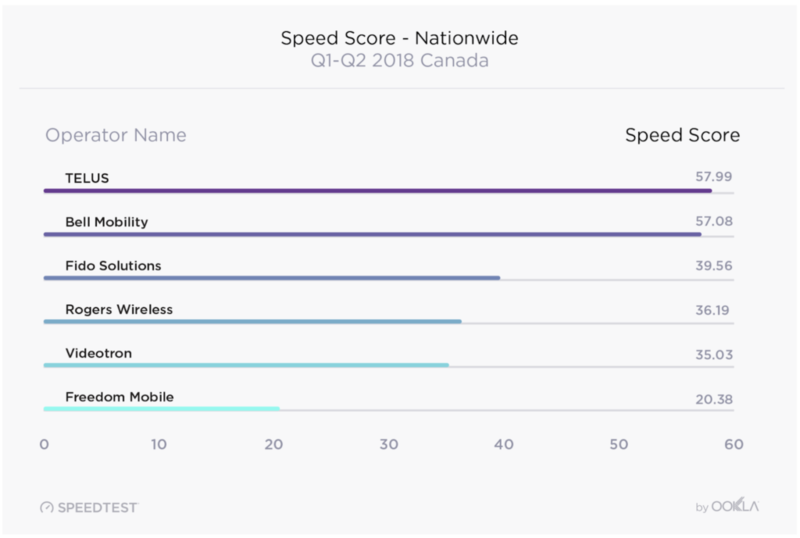 Internet performance analytics company Ookla has released the results of its Q1-Q2 2018 speedtest report, revealing that Vancouver-based national carrier Telus has the fastest mobile internet in Canada. 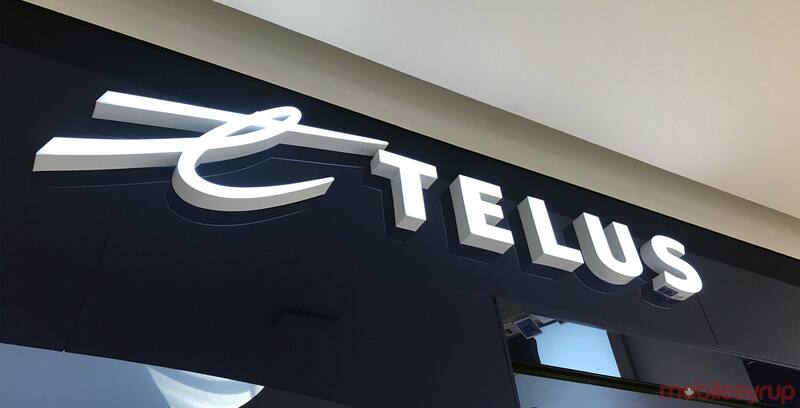 According to Ookla’s September 19th, 2018 report, Telus was able to achieve a Speed Score of 57.99Mbps across the country. It’s important to note that Ookla determines its speed score by factoring in a carrier’s download and upload speeds from the 10th, 50th and 90th percentiles, combining them for a weighted average using a 1:2:1 ratio. Ookla says that 90 percent of a Speed Score is determined using download speed, while the remaining 10 percent is determined using upload speed. Montreal-based national carrier Bell came in second place, with a Speed Score of 57.08. Rogers flanker brand Fido came in third, with a Speed Score of 39.56, while Toronto-based national carrier Rogers came in fourth with a score of 36.19. Quebec-based regional carrier Videotron placed fifth overall, with a score of 35.03 and regional carrier Freedom Mobile came in sixth, with a Speed Score of 20.38. According to Ookla’s report, the mean download speed across Canada was 46.96Mbps, while the mean upload speed was 11.85Mbps. The country’s download speed increased by 40.8 percent compared to Q1-Q2 2017, while the country’s upload speed increased by 15.8 percent compared to the same time last year. In addition to offering the fastest mobile internet download and upload speeds, Telus and Bell secured the top spots in Canada’s 10 most populated cities. It’s worth noting that Telus was able to secure the top five slots. 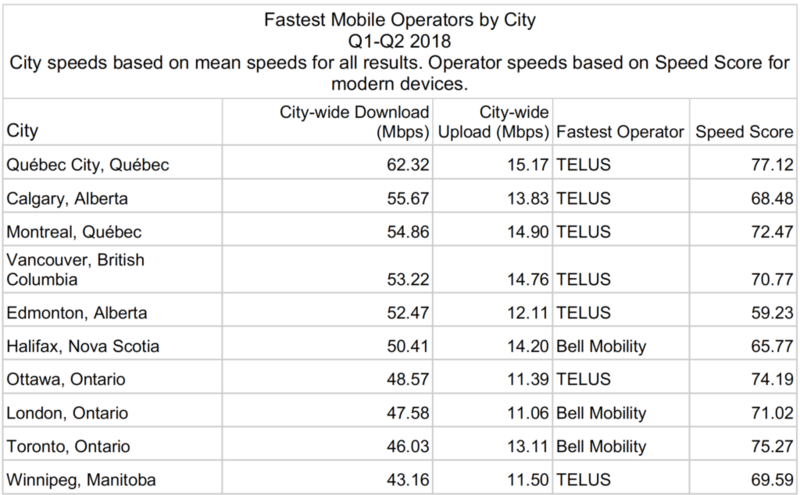 According to Ookla’s report, Quebec’s capital Quebec City has the fastest mobile download and upload speeds in Canada. Telus’s network produces average download speeds of 62.32Mbps, while Telus’s network produces average upload speeds of 15.17Mbps. Toronto, Canada’s largest city by population and Ontario’s capital, took the ninth-place spot overall. Bell reportedly supplied Torontians with average download speeds of 46.03Mbps and average upload speeds of 13.11Mbps. In contrast, Canada’s capital city Ottawa secured the seventh-place spot. Telus supplied Ottawans with average download speeds of 48.57Mbps and average upload speeds of 11.39Mbps. Ookla gathered its data using its Speedtest internet speed application. The company gathered results from 238,480 unique users who completes a total of 741,557. Ookla produced its report by studying 31,145,394 data points. What’s worth noting is that PCMag‘s mobile network speeds report also revealed that Telus is Canada’s fastest carrier. According to PCMag, Telus averaged download speeds of 174.67Mbps and upload speeds of 31.48Mbps. Both PCMag and Ookla are both Ziff Davis.